I want to expand on the stated highlights of my trip, with professionalism being the 1st topic that I talk about. Ironically, multiple situations since my return have had the topic of professionalism on my mind. So I am glad it is the 1st topic. To be a professional, according to Merriam- Webster is to “characterized by or conforming to the technical or ethical standards of a profession (2) : exhibiting a courteous, conscientious, and generally businesslike manner in the workplace“. Wow that absolutely sums it up doesn’t it?!? No wondered Merriam-Webster are the definition experts!! The traits I saw exhibited by all the Groundsmen I met on the trip is amazing. The “technical or ethical standards” of our profession are being created by these Groundsmen. Placed under such impossible demands from weather and from traffic, they are setting the standards the rest of us are “characterized by or conforming to”. Pitch quality continues to rise, and less than perfect is absolutely unacceptable- even if the weather or challenge could be used a plausible excuse for them. And the “courteous, conscientious, and generally businesslike manner in the workplace” that I saw exhibited was even more captivating to me. Theses professionals understand that extra traffic on a field is reality.. so they spend their time working to figure out how to produce the best turfgrass possible with a positive, “get it done” attitude. Negativity does not exist. The challenge is respected. With the examples that I observed from the European experience, I continue to think about how I can help our operation at Maryland SoccerPlex set a stronger example of professionalism. And I challenge anyone reading to consider each and every part of your day- from goal setting to communication. Then think about the definition of professional: “characterized by or conforming to the technical or ethical standards of a profession (2) : exhibiting a courteous, conscientious, and generally businesslike manner in the workplace“. Does Merriam- Webster describe you and your operation as well? If not, I hope that reading this provides some motivation and insight. Writing it has added even more into my very own. Thank You to our European friends yet again!!! The reason for the timing of my trip to Europe was that the playing season was wrapping up and the renovation season for the pitches is beginning. I wanted (or better stated, NEEDED) to see the renovation process taking place to get a better understanding of how it works and all the positive pieces of the process. My perception from the pieces of the process I had heard and read about were that the UK groundsmen must just really like to make themselves extra work! haha. Why would you want to cut out your fields every year and wait for them to grow back in from seed? Madness! Well- I certainly got to see it 1st hand… and it was nothing like I imagined. Instead of madness, I say now that it is genius! Quite a change huh?!? Let me try to explain the process and the goals…..
How to renovate? 1- Remove the top 1/8 to 1/2″ of the pitch (termed “Fraze mowing”). 2- Proceed with a deep aeration (deep tine or Shock Wave) 3- Apply a layer of topdressing and/or run a Recycling Dresser (http://www.imants.com/en/machinedetails/13/296-225/KORO-Recycling-dresser-1900) to freshen up the soil base and create some loose material. 4- A harrow is then drug across the surface to move around the loose material and fill in the low spots before the seeding takes place. 5- Seed, work in the seed and lightly topdress again. 6- Fertilize. 7- Grow. Four weeks later, the seed has germinated and is growing, and the hardy plants have regenerated and filled back in. ARTWORK. Sounds like quite a process huh!? Well, it absolutely fascinating… and amazing. So then the question becomes… does any of this process make sense in the United States. Your initial reaction is likely the same as mine- No! But then realize that no matter how good the poa controls supposedly are, the still don’t really work- and that we could be facing the same bans on pesticides in the future that they do in the UK . Think about renovating a football field in the spring (that needs spring time renovation anyway)/ to Fraze Mow Bermudagrass in the south that is overseeded heavily and needs transitioning/ Renovate soccer fields that are used for spring and fall play/ Fraze mow the lips around the edge of baseball infield skins after the season… And we could sit and talk and come up with more and more where pieces of this process could fit in. The boldest part, without a doubt, is to re-seed and not to sod. Adding the layer of soil in sod is obviously a challenge. And with a tool like the Recycling Dresser, that layer can be reduced much more quickly. But if and when a field has 6-8 week open for a renovation, why not seed instead of sod? I am considering that very thing… we are renovating our stadium field (because of poa) the last week of August. I can seed by the end of that week and have 6 full weeks before our next event. When I stop and think, of course it can be done- but wow, that sure does take guts right!?! But to save $50k. 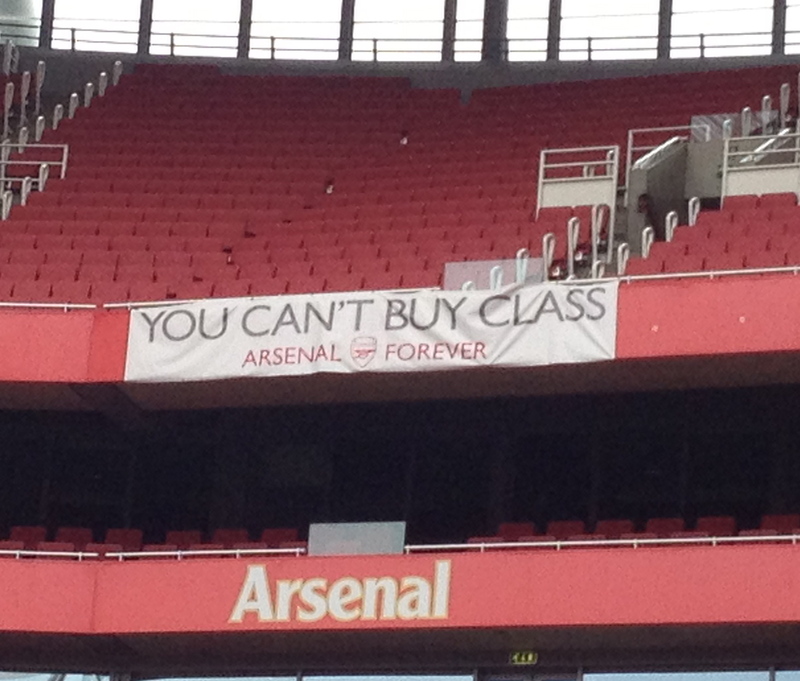 HHHmmm… make you think right!? Returning to DC this afternoon, its like I never left. Inconsistent weather continues!! Examining the pitches at SoccerPlex this evening, we are still fighting the same inconsistent growth on cool season and bermudagrass. Its all good though.. we need the rain, and the sun looks to be coming by Wednesday! 1) Professionalism- The professionalism exhibited by all the Groundsmen I met on the trip is amazing. They understand that extra traffic on a field is reality.. so they spend their time working to negate it. These 4 topics are a great start- I look forward to expanding on them more at length to create many, many new ideas! Well what a change from Manchester to Madrid. WOW it is almost HOT here! But I am not one to ever complain about heat… so bring it on. It is refreshing! Arriving in Madrid Friday night, many many Thanks to Mr. Paul Burgess for taking the time to make a trip to the airport and then to show me around on Saturday. With preparation taking place for tonight’s final La Liga match- after which Real will be presented with their 32nd league championship trophy and with renovations taking place at the training ground, Mr. Burgress is very, very busy man! Saturday Paul was gracious enough show me around on the pitch at the Bernabeu. WOW what a stadium. And WOW what a fantastic pitch. Absolutely great stuff. 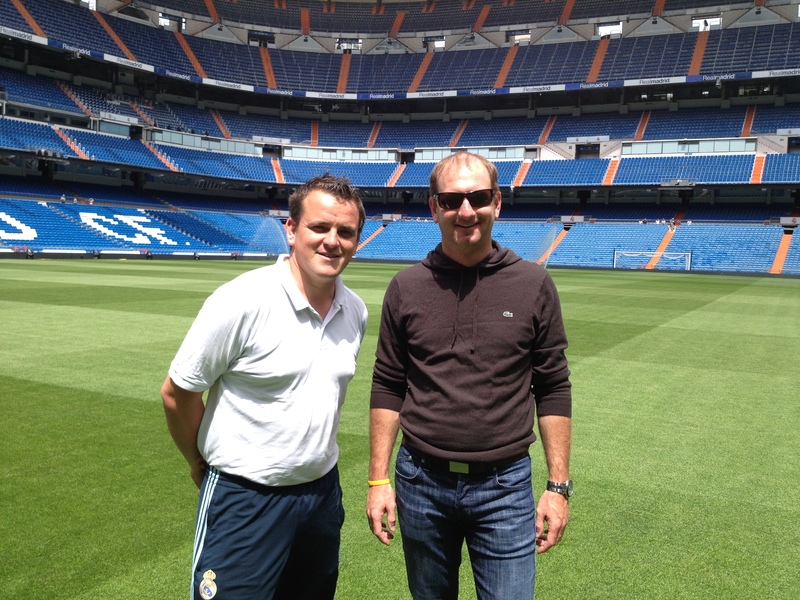 Following, Mr. Burgess gave the tour of the Real Madrid Training Ground. With the number of fields and tremendous amount of play that takes place on each pitch, it reminded me even more of home. The observations and conversation created a wide range of new ideas for me. Thank You, Thank You, Thank You Paul! Now tonight, the fixture between Real Madrid and Mallorca… What an experience it shall be! Real is in the hotel here currently preparing for the match… and what an atmosphere it is outside. So I can only imagine what it will be like at the Bernabeu tonight! Friday marked the final day of my expedition in the United Kingdom. COLD was the theme of the day. With temperatures not rising above 45 degrees F, a breeze, and some rain showers- Wow. What a challenge to grow grass! Kudos to ALL the groundsman in northern Europe… I have heard that its cold in those areas, and that is true! The day started with a stop at historic Old Trafford. Do I really need to say more? It is absolutely everything that is hyped- What a gorgeous and classic stadium. Thank you to Tony Sinclair, Head Groundsman at Old Trafford, for showing me around and sharing some absolutely fantastic ideas and thoughts on the success of maintaining such a wonderful pitch in the cold, wet conditions of the Manchester region. Tony’s professionalism and fantastic attitude towards the challenges they face were extra motivating to me as we look at tackling the challenges daily faced with 22 pitches and all the events at SoccerPlex. The very best of luck to Mr. Sinclair and his tremendous staff with those upcoming challenges- including several matches for the Olympics. Leaving Old Trafford, we headed over to Etihad Stadium, home of Manchester City. With both teams tied for the Premier League title going into the final weekend, it was absolutely amazing the experience the intensity and anxiety and the anticipation in the air around both clubs. What a wonderful situation for Manchester as a city, no matter what side you are on- The world is talking about Manchester through Sunday! The Head Groundsman for Etihad Stadium, Mr. Lee Jackson, took time to visit with us and show me around even with preparation ongoing for their final Premier League match on Sunday. Thank You to Mr. Jackson for doing that- I would like to think that I would do the same for a total stranger from out of the country if they came to visit me even during preparation for one of the biggest events of a lifetime. Mr. Jackson’s pitch is suburb… I am amazed how successful its possible to be with growing grass through the dead of winter and into miserable weather conditions like they are experiencing in Manchester this spring. There is so much to learn from these places that I have not even begun to comprehend it. Manchester United’s Carrington Training Ground was the next stop of the day. In what was one of the few disappointments of the trip, Head Groundsman Joe Pemberton was unavailable. So sorry to have miss you Joe! But Mr. David Lindop was very generous with his time to welcome us and show me around. The training ground buildings are going through renovations and upgrades, as were many of the pitches. “Busy” is only half a strong enough word to describe how things are around the training ground. So Thank You David for still allowing me to spend some time with you and pick up many valuable lessons. Our conversations and seeing another piece of the renovation process was so helpful! In route to the airport, our final stop in the Manchester area was at Salford City Stadium, a new rugby stadium. Mr. Danny Huffman, Head Groundsman, was in preparation for rugby events this weekend. With the stadium opening in the early winter, the pitch has been played on frequently during its few months. Mr. Huffman has succeeded to maintain a fantastic surface all the while establishing the young field even more. The pitch has Fibre Sand, so the opportunity to talk about the technology and get feedback surrounding the reinforcement was very, very helpful. Thank you for the time Danny- it was extremely rewarding for me! Friday evening lead to the departure of Manchester with a flight down to Madrid, Spain. WOW it is HOT! Unseasonably warm weather is blessing Madrid and our trip… what a change from Manchester! THANK YOU, THANK YOU, THANK YOU to Mr. Simon Gumbrill of Campey Turf Care for the hospitality, the guidance, and the wonderful feedback and wide range of ideas and discussions over the period of Tuesday morning until Friday evening. Traveling through 5 countries and several hundred miles, I am sure there are points he wanted to pull the car over or hit the eject button with all of the questions I was asking. Thank you again Simon- And Thank You to Mr. Richard Campey and the entire staff of Campey Turf Care for the respect, the time, the ideas, and the support. Absolutely a class act of an organization! 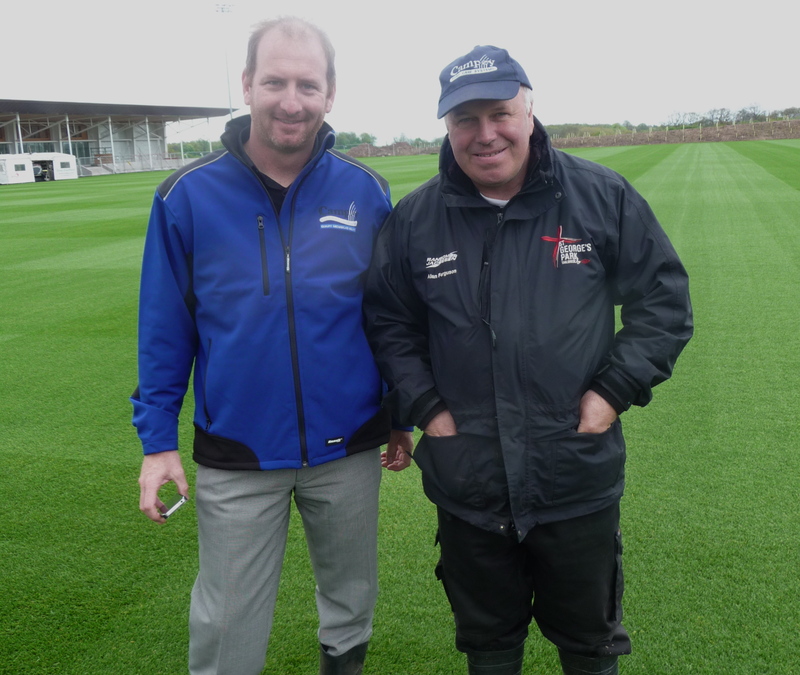 Thursday marked a visit to see Mr. Alan Ferguson, the Head Groundsman of the English FA- tasked with getting St. George’s Park prepared for its opening this summer. The FA is in good hands, that is for sure. Not only are the pitches absolutely gorgeous but Mr. Ferguson and his wonderful wife, Mrs. Carol Ferguson, have a vision for the park is grand and fantastic. I can not thank either of them enough for taking time to see us today to show us around and share some stories over tea, The conversation, the ideas, the attitude, the dedication I hope to be able see the park again next year to see the dramatic change it will go through. The expanse of the park and the rolling hills reminded me alot of home at SoccerPlex- and so did all the rain!! Thank you again to the Ferguson’s for having us- and to Mr. Simon Gumbrill for leading the escaped through London, France, Belgium, Netherlands, and now back to Manchester in the northern UK. We visit the champions tomorrow- Now which will it be… Man U or Man City! ?